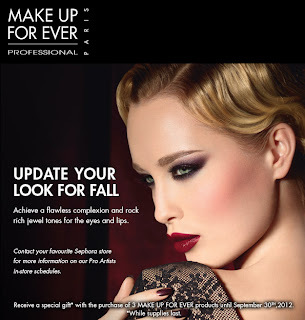 Beyond Blush: MAKE UP FOR EVER Promotion @ Sephora! MAKE UP FOR EVER Promotion @ Sephora! MAKE UP FOR EVER is having a great promotion at Sephora this month! I’m a fan of MUFE, and if you are too, this is a great time to make some purchases. My favourite products from MUFE are their Lab Shines, HD Foundation, and HD Microfinish Powder. I really want to try their Smoky Lash mascara, because everyone raves about it! I also want to try their Full Cover Concealer, as I’m in the market for a new concealer. Will you be stopping by Sephora to take advantage of this offer? Let me know what your favourite MAKE UP FOR EVER products are! J The promotion lasts until September 30th, so you still have time to do some shopping!